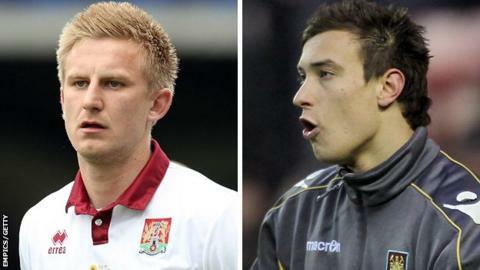 Yeovil Town have signed defender Byron Webster and goalkeeper Marek Stech on two-year deals. Glovers manager Gary Johnson signed Webster during his reign at League Two Northampton last season. But the 25-year-old ended his contract at Sixfields by mutual consent in order to rejoin Johnson at Huish Park. Stech, 22, spent time on loan with Yeovil from West Ham last term and was released by the Hammers this summer. He becomes the first permanent keeper on the Glovers' books since 2008-09 season. Johnson told BBC Somerset: "It's not always easy to find the good standard of goalkeeper you're looking for at the budget you can afford, but on this occasion we've done both. "It's a really good deal and the club has done well." Commenting on Webster's arrival, Johnson added: "Byron has been unlucky with injuries in recent years. "I've been lucky in that Northampton haven't seen enough of him. I have, and I think he's a good addition."